Our July roundup is filled with #EverythingATL inspiration for things to do in Atlanta's most iconic neighborhood. Take a yoga class in an underwater wonderland, cheer on Atlanta United and the forthcoming college football season, celebrate ice cream and holidays around the world...it's going down in the District. The annual festival of Tanabata is a Japanese holiday celebrating the meeting of two star-crossed deities, Hikoboshi and Orihime, who are separated by the Milky Way Galaxy and only allowed to meet once a year. Children’s Museum of Atlanta and Atlanta’s Nakato Japanese Restaurant representatives will bring this colorful festival of stars to life by offering authentic origami classes in the Art Studio and the opportunity for families to march in a traditional Tanabata lantern parade. Little ones can learn more about the lunar holiday and rich cultural history by listening to Japanese children’s stories at Storytime and engaging in the tradition of writing Tanabata wishes of good fortune. Punch Brothers are the quintet of mandolinist Chris Thile, guitarist Chris Eldridge, bassist Paul Kowert, banjoist Noam Pikelny and violinist Gabe Witcher. Says the Washington Post, "With enthusiasm and experimentation, Punch Brothers take bluegrass to its next evolutionary stage, drawing equal inspiration from the brain and the heart." Their upcoming album, All Ashore, is out July 20 on Nonesuch Records. Catch them at the Tabernacle, ATL's most iconic live music venue. Nothing beats the heat like ice cream in the summer! Families can visit the Museum for National Ice Cream Day and take a break from the sun for a cool treat. Children are encouraged to stop by the Science Bar at the top of every hour, between 11 a.m.-2 p.m., to discover the science behind making ice cream with Professor Labcoat. In addition, families can embark on a scavenger hunt and cooking class with Eat a Georgia Rainbow to explore the foods that are harvested in Georgia throughout the year. Little ones can also get moving with programs like Music & Movement and dance along to the Mini-Musical. SEC Summerfest, presented by Regions Bank, the ultimate fan event to kick off the 2018 football season. Attendees will have the opportunity to engage with fellow SEC fans in a family-friendly game day environment anchored by the first SEC Nation of the 2018 Football season. Activities include live music, food trucks, interactives and much more - all in Centennial Olympic Park. The SEC Nation show will be live from 6 p.m. to 8 p.m.
Unite and conquer at this home game in Mercedes-Benz Stadium, where crowds of 70,000+ fans keep it rowdy and proud and red, gold, and bold. Join the Center for Civil and Human Rights and Humanity in Action as we explore the intersection between the music community and the American Civil Rights Movement. Guests will enjoy a music listening workshop, dissect some of the most easily identified powerful song lyrics and uncover the underlying calls to action that spark, social change and community awareness. 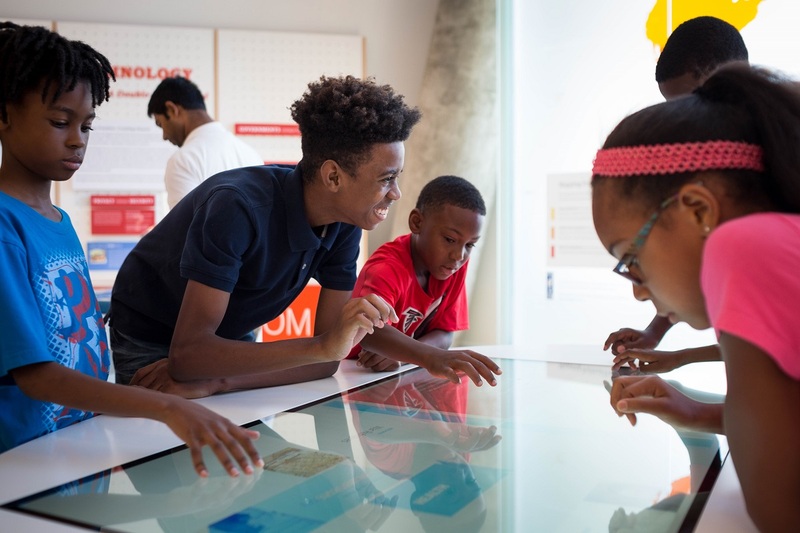 Celebrate World Emoji Day at Children’s Museum of Atlanta! Little ones can join the Imaginators for themed programs to learn all about understanding and communicating emotions. Visitors can create their own paper plate emotion wheel of emojis in the Art Studio and kids will learn to express themselves through dance during Music & Movement. Join the Center for Civil and Human Rights and Humanity in Action for an evening of introspective reflection through the documentary, John Lewis: Get In The Way! Despite his humble upbringing in rural Alabama, after hearing the voice of Dr. Martin Luther King, Jr. on the radio, 15 year old John Lewis understood his call of duty to serve alongside fellow activists for civil rights. From the sharecropping field to Capitol Hill, his experiences as a youth activist and civil rights advocate connect him to the people he serves. Eric DaSilva hosts seven of today's leading local stand-up comedians, showcased in a line-up that will make you feel like the weekend came early. These nationally headlining comics are lucky enough to call Atlanta home. And what do you do when you're back home? You hang out with your friends and have a great time! So, before they hop on a train, fill their tank with gas, or catch a flight, come see how they make hysterical happen right here in the Cotton Club.